It was a beautiful day on the river. Sunny and warm with intermittent good wind. Although I finished in roughly the same place I do most Sundays (that is, near the back with a rare strong race), today worked in my favor as there were only 5 or 6 boats, leaving me with my first 3rd place finish. The wind was flukey, very light at times followed by a strong steady breeze. The wind kept shifting at the beginning, making it nearly impossible to set a windward-leeward course. In fact, the first race turned into reaches both ways. 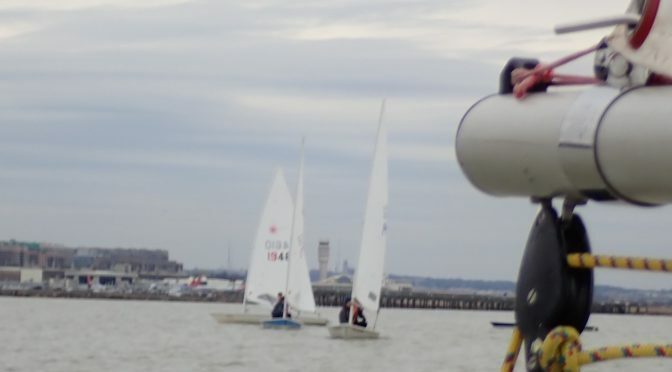 After the first race, the wind held relatively steady – in direction if not speed, allowing us to get in lots of races. 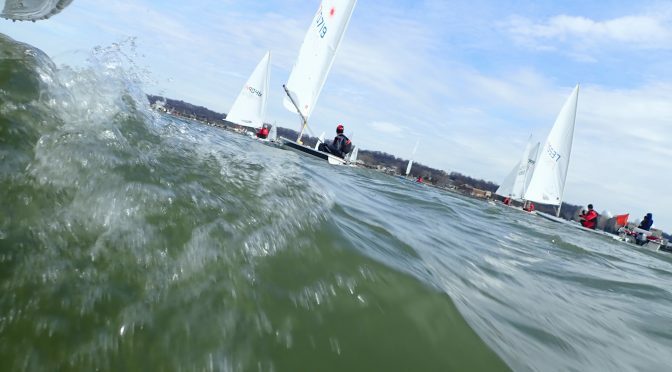 With a small fleet, it was much easier for those of us new to Laser racing to be aggressive at the start and at the marks – instead of being out strategized by lots of boats, there was only one or two to content with at each rounding. The shifty wind favored those with good tactics and a good sense of the river winds – boats well ahead often lost considerable ground to others on a different tact, seemingly at random but clearly not since the top two boats consistently finished 1-2. The winds also, at times, left the fleet bobbing in the water for a few minutes before picking up again (I’m guessing the windier parts of the day were above 10 knots if not more). As a new racer, I found the smaller fleet a great opportunity to work on sail trim, starts and mark roundings. 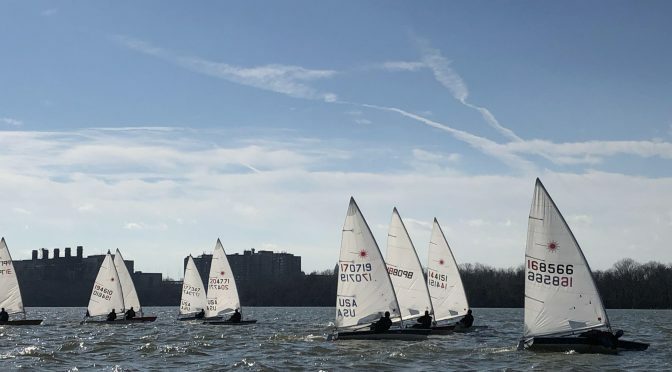 Other than to note a number of us have been talking about finding times this spring and summer to sail, not much else to report other than to thank the race committee and to encourage people to come out for the last few weekends of the series. What lovely warm day of racing we had. Today was my third day out this season and my first where I did not feel like I was in survival mode, so I really appreciated that – this is also my first third-place write-up. The course was relatively short, so even with twice around and we got in a lot of races, which was great. Overall, it was a quite puffy and shifty day that required a lot of paying attention (wow, pin favored now, OK!) and for me, a lot of shifting gears. Especially at the start of the day, the ebbing tide made it easy to be over the line early and our first start ended in a general recall. After that, I had some decent starts and some less optimal ones, but found that it was possible to move up by focusing on keeping the boat moving and sometimes sucking it up and fighting for a tiny lane on the lifted/mark-pointing tack (especially in some of those early races) instead of bailing for clear air but a header/heading away from the mark. Also, later in the afternoon, it seemed windier than it was due to the chop – so while I was tempted to haul in my outhaul upwind, I found that by leaving it a little loose (3/4 shaka?) it helped me keep boatspeed up and power over the waves. Downwind, I was perpetually switiching up the vang depending on how windy it was – and how windy it might be in the next minute or so – it was a real balance between speed in the lulls (less vang) and then cranking it on (perhaps even a bit much at times) to feel solid and avoid death rolling. I can’t remember when I last played with the vang so much downwind. Another challenge downwind was to be mindful of the mark location – I found myself wanting (expecting?) it to be further east than it was and lost a few boats one race because I went too far outside the rhumb line and folks passed me inside. Hoping for another couple of warm days like yesterday for the remainder of the season. Thank you to our race committee for helping us pack in the races and to everyone who showed up to sail! Checking my email this morning I discovered a message from Will. The third place writeup has befallen unto me. I came away Sunday feeling pretty good about the racing. I thought that I was in the top half every race, but I didn’t expect the third. Wow. Unfortunately, I don’t remember that much. Maybe that’s not a bad thing. Usually people say that I write too much. This is going to be short. The first lesson learned is not to get discouraged by the weather forecast. Sunday promised snow when I woke up. Should I even head to the marina? That was my big debate with myself for the day. Turned out to be one of my most successful days in quite a while. The second lesson is to try to relax and don’t forget the basics. I managed to get good starts in every race. I kept testing the middle of the line at the three minute horn with my bow upwind. 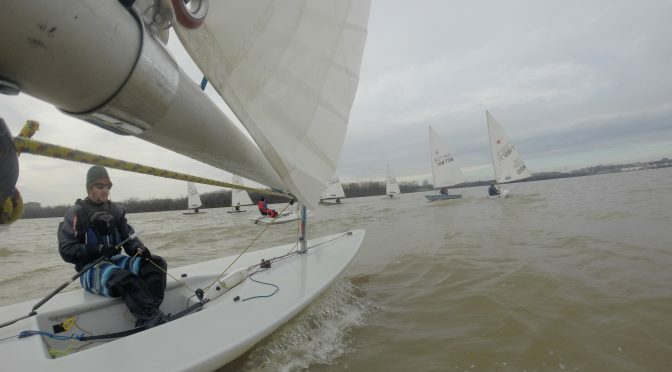 The wind kept shifting left and the port end was favored in most races. I then reached down to the committee boat side and found my spot with about a minute to go. The line was just long enough that I could dip down a few times and start close hauled right at the gun. For some reason the favored end wasn’t that crowded. When I saw another boat coming up under me I luffed my sail and let him take the pin. I was then satisfied to get off the line second. Usually, the line was so favored that it was difficult for more than one boat to do that. I think I managed to find a groove where I managed to dip down just enough to maintain good rights but not so far down that I lost all speed pinching up to make the pin. The wind was shifty, but I didn’t worry too much about always being on the favored tack. If you get off the line fairly well, you want to avoid disasters. Don’t sail up to the windward mark on port into a line of starboard tackers. A couple of times I lost a few boats playing it safe that way, but with a short course and a big fleet it’s more important to avoid the big mistakes. Once or twice I managed to round the windward mark first. Where the hell is the leeward mark. I wish I had checked that before the race! I ended up taking a course too far to the left in a couple of races. That cost me a couple of spots. I guess I took it one race at a time, wiping my memory after each finish getting ready for the next. It was great fun. Thanks to everyone for coming! Today was looking a little iffy when we woke up this morning. With a pending gale warning starting at 3, we were not too sure what the weather was going to have in store for us. Nabeel and Kevin were on race committee and were optimistic to get some races in before the gale came. We decided that we would go out and race until the wind shifted to the west which would be when the big breeze would come in. We ended up getting 5 races in without the wind ever getting too crazy. With the sun out and the temperature getting close to 60 as well as breeze in the upper teens and low twenties I doubt anyone was cold today. We did triangles for the first 4 races and finished with windward leeward for the last race. There was lots of capsizing, I do not think anyone made it through the day without at least one. The breeze was mostly out of the south but there were some small shifts that had to be looked for, The first 2 races had the most breeze and then everything kind of moderated out to something in the mid teens. With a south breeze, a flooded river, and changing high to low tide, the long upwind leg didnt take too long due to the current. The triangle courses didn’t allow much to happen tactically outside of sailing fast, keeping the boat moving, and not capsizing (or if you did capsize have a quick recovery). But the downwinds were pretty fun with some nice waves to surf. But the waves were fairly choppy and I found it best to move your weight forward and backward in the boat. This was both to keep the boat on the wave as well as not dive your bow into the wave in front of you. All in all, it turned out to be a very nice day on the water and the high winds never really seemed to show up. Just goes to show that the forecasts are not always right and its always worth coming down to the marina to at least see what is going on. With a 2-year old now and another on the way, I haven’t been out for a Sunday frostbite in 2 winters. Sadly, this wasn’t a particular awesome day to come out. Regardless, it was good to get out, splash the boat, and see everyone. I didn’t finish in 3rd, but Farley and Len nominated me to do the write-up. * The wind was light, incredibly light. The river was best (maybe 6 – 8 knots) right when we launched and died throughout the afternoon to 0 (requiring some rocking & paddling to get home). It started south / southwest (power plant) and then moved to south / southwest (wastewater plant) about 1 hour into racing. * Simply put, what becomes particularly key when conditions are this bad is that the delta between a puff and hole is huge in terms of percentage of boatspeed compared to when there’s a moderate amount of wind (i.e., compare a 7 knot puff vs 5 knot steady breeze to a 3 knot puff vs 1 knot steady breeze). On days like that in situations like ours (with such short races), it’s important to shake yourself free at the start (i.e, have lane or be able to tack), keep your head out of the boat, and to try to situate yourself to catch the next puff as it comes down the river. The boat leading at 2/3 up the windward beat will then likely win the race. * Of course, keeping the boat moving in the light stuff is really tough. I’m honestly a bit better in breeze (who isn’t) and typically have ingrained that you always have to keep moving in the boat (shift forward, tweak sails constantly, sail the boat flatter / with more heel etc.). However, when it is really light, that strategy doesn’t work, especially downwind. Too much movement just disrupts flow on the sail and the foils. Downwind, it’s important to get situated and not move. Get the sail out past 90 degrees, get the board up, and heel the boat to windward. If nothing else, this at least keeps the main from falling back into center and keeps it ready to catch any puff. I find that leaning out a bit on the boat with both feet in the cockpit can be the most comfortable to remain perfectly still. You can then basically heel the boat over with just your shoulders or head. * Upwind, lots of tacks (unless you’re particularly great at roll tacks), won’t really help. Frankly, sitting on a header for a short spell (just to keep the boat moving) can pay off vs. trying to catch any 10 degree shift. Today was one of those days where the best move was to pretty much keep the boat pointed upwind at the mark and adjust the sails around the direction of the breeze. * Len assured me that he hadn’t seen any current flood this year given the high amounts of rain. The RC conveniently had noted that low tide was at 12:30. By the windward mark of the 3rd and final race, it was clear that the current was ripping upriver into DC. When current is that bad, keeping flow and the boat moving is pretty important (tacks just result in you going backwards). * When the breeze is light and fluky, it’s important to stay awake between races and not drift off too far from the line / starting area. In either the 2nd or 3rd race, only a handful of boats were on the line. Great day out on the water just what we all needed sun and wind, don’t know what those gusts were getting up to but they had the potential for trouble! Quite a bit of chop in the river today so somtimes it was hard setting up the rig, tight and point high into the chop verses, loose and go for speed, I went with the point high option. Down wind was all reaching so capsize potential, not so bad once the boat up on the plane. The windward mark seemed to still have a lot of water pushing on it or perhaps it was just a lot of leeway on the boat. Did not get the vang of in time on last race semi-capsized, not good. In a breach of tradition, I was asked to provide some thoughts on today’s racing. 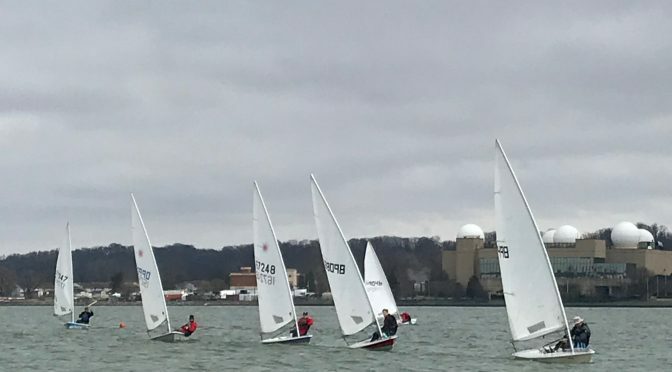 I am not going to recount each race, but as we all know the breeze was light all day and the current was slack for the first race, but progressively got stronger heading down river (and upwind) making the beats short and the down wind legs seem much longer. The pin end was favored to varying degrees throughout the day. The upwind leg was short so it was imperative to get off the line quickly today as there was little opportunity to recover from a bad start (as a learned after flipping at the start…). What worked for me today was to get a clear air start at or near the pin, get the boat moving as fast as possible and then look for an opportunity to tack to port and towards the windward mark. Simple in concept, sometimes tougher in execution…. I think in the light conditions we had today it is critically important to constantly seek to find more power in the rig. This means a loose outhaul (one to one and one half hands at the middle of the boom), loose Cunningham (or maybe just a tiny bit but not enough to remove wrinkles), and Vang slightly less than block to block tension (You want the mast to straighten when you ease the sheet for power). I don’t think I ever was able to “two block” my sheet tension today, but generally had my sheet eased out between 6-18 inches depending on wind pressure. The key to light air speed is to ease the sheet for power to get the boat moving. As the sail powers up, you can then apply more weight on the rail, which translates force into your foils and increases boat speed. As the speed builds, you can trim the main for greater efficiency. The trick is not to let the boat stall after you trim in more closely. After you trim in and you start to feel the boat lose power you have to immediately ease the sheet again to get more power. Adjustments should be pretty subtle unless there is a big wind speed change. I believe this cycle of easing for power, applying weight to the rail to increase speed, and then trimming as the boat accelerates is key to being fast in light conditions. Similarly, I think the most important factor downwind was working to keep the boat powered up. Whenever it got really light downwind I felt it was fast to either head up 15-20 degrees or sail aggressively by the Lee to increase flow across the sail. Once the boat was moving well, then it was time to head more towards the mark. I think I ended up gybing on every down wind leg because I sailed “hotter” angles and almost never dead down wind. Hope a few folks find this helpful. Thanks to all for sailing today and Happy New Year!